Searching for black Proteus (Proteus anguinus parkelj) in karst groundwater with the help of eDNA. The black Proteus (Proteus anguinus parkelj) forms a very small and endangered population of the only European subterranean amphibian. Since its discovery in 1986 until the most recent sighting in 2012, the black Proteus has been documented at only four sites in extreme Southeastern Slovenia. They are situated within a 2 by 2.5 km maximum aerial distance from each other. Nearby in the same geographic area, but presumably in a different geological formation, the nominate troglomorphic white Proteus (Proteus anguinus anguinus) has been spotted at about 10 sites (springs and caves), several of which have never been verified by experts. Since the habitat of Proteus is inaccessible to man, we developed an environmental DNA-based assay of spring water samples to test for its presence. Employing TaqMan qPCR chemistry with specific probes and primers we (1) conducted a systematic inventory of Proteus presence in the region, (2) verified certain historic records of white Proteus, (3) determined the maximum span of the black Proteus range to the East and South, and (4) tested for possible co-occurrence of the two subspecies. We detected black Proteus eDNA at five new sites. In one of these we found both black and white Proteus eDNA syntopically. These results are consistent with known hydrogeological patterns, and suggest a possible contact or parapatry of the subspecies. eDNA data can therefore, when used together with information from phylogeographic and population genetic analyses, broaden our knowledge of species evolution and systematics, as well as help establish efficient conservation measures through updated distribution maps of the species. A PDF of the program is now available for download. Click here to view the program. A PDF of the abstracts is also available for download. Click here to view the abstracts. Web versions of the program and abstracts have also been posted. Dormitory check in starts at 12:00 on Sunday and continues through the evening. If you are expecting to check-in after 22:00, please let us know. The building (Northwest Quad B) is on the north side of the campus close to the intersection of Garland Ave and Cleveland St. Parking for the dorms is in Parking Lot 37. The parking section of the website has a description of the parking area and the process to get a parking permit. Parking in this lot is free on weekends, but you will need a parking permit for the weekdays. You will need it to keep your vehicle there Monday morning. The parking section of the website describes how you can purchase and print a parking pass. If you wish to pay and pick up a parking permit in person, there is time before we start on Monday morning to visit the Parking and Transit office. Information is available by navigating from the links in the parking information on the website. 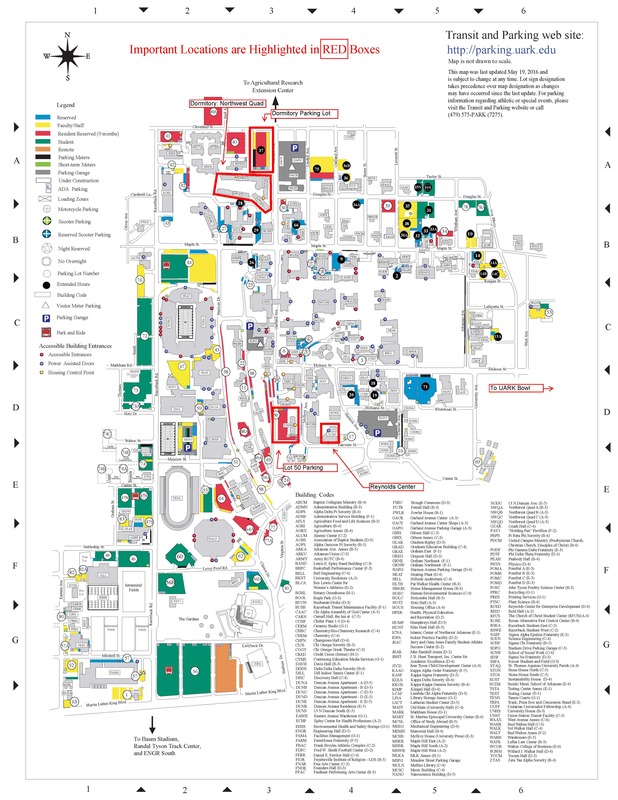 If you open the parking map, you will see Parking Lot 37 and the Northwest Quad highlighted in red polygons. Northwest Quad B is labelled (NWQB). Enter the building and check-in on the southwest side. Due to the large number of conference participants, the length of each oral presentation has been reduced to 15 minutes, including time for discussion. The 15-minute time limit will be strictly enforced to remain on schedule. Please prepare a 12-minute presentation followed by 3 minutes allotted for questions and discussion. Recipients for the ISSB, Den & Shielah Roenfeldt, and The Crustacean Society Travel Fellowships have been announced. These awards will offset costs for registration, travel, and lodging to attend the 2016 ICSB meeting. More information can be found here.